• Signed Option to acquire 33 lode claims in San Juan County, eastern Utah. • Adjacent to the only Uranium – Vanadium producer in the region, Energy Fuels Inc. (EFR:TSX, UUUU:NYSE). • Virtually unexplored using modern techniques although historical vanadium mining operations located within eyesight of Property. LA SAL DISTRICT - URAVAN PROJECT (Including the FF and VQ claim groups) San Juan County, Utah, U.S.A. In January 2019, Spey Resources Corp., acquired an option to earn a 100% interest in the Uravan Property located near the west end of the La Sal Mineral Belt, about 40 miles southeast of Moab and seven miles west of the town of La Sal, Utah, near the border with state of Colorado. The claims cover prospective geology immediately north of and adjoining the historic Firefly, Blue Cap, Gray Daun and Vanadium Queen mines. The Uravan Project consists of two core properties, FF and VQ, located in San Juan County, Utah near the village of La Sal (Figure 1). Other properties within the La Sal District include property held by Energy Fuels Resources Corporation (“EFR”) and its various subsidiaries. The main projects of EFR include their Pandora, La Sal and Energy Queen Mines. The all-weather Utah State Highway 46 is within one mile of the Project boundary. Unpaved Forest Service roads provide access to most areas of the Project. All other portions of the Project are accessible via County or private dirt roads. The Project area is currently serviced by nearby power lines and other utilities. Numerous underground mines near outcrops in the eastern part of the La Sal Trend (La Sal Creek Canyon District) extracted vanadium and uranium during the early 1900s. Deeper deposits of the central La Sal Trend (the area of EFR Projects) were discovered in the 1960s and developed for production in the 1970s through vertical shafts and declines. La Sal Creek District production through 1980 totaled about 6,426,000 pounds U3O8 (average grade of 0.32% U3O8) and nearly 29,000,000 pounds V2O5 (average grade of 1.46%) (Kovschak and Nylund, 1981). Most production in the district was derived from fluvial sandstones, mainly in the upper part of the Salt Wash Member of the Morrison Formation of Jurassic age. Sandstone lenses in the overlying Brushy Basin Member of the Morrison Formation host uranium-vanadium deposits in some locales. Sometime after World War II (approximately 1948-1954), exploration work on Morrison Formation outcrops in the west end of the district resulted in the discovery of the Rattlesnake Mine (Pit) two miles west-southwest of the Energy Queen shaft (U.S. Atomic Energy Commission, 1959), on claims now owned by EFR. The Pandora mine was operated by Atlas Minerals in the 1970s and early 1980s. Umetco Minerals Corporation (“Umetco”), a subsidiary of Union Carbide Corporation, operated the Snowball, La Sal, and Beaver Mines during the same time period. The Energy Queen Mine, then known as the Hecla Shaft, was started in 1979 by the Union Carbide/Hecla Joint Venture. The mine stopped production in 1983 due to inadequate uranium prices. 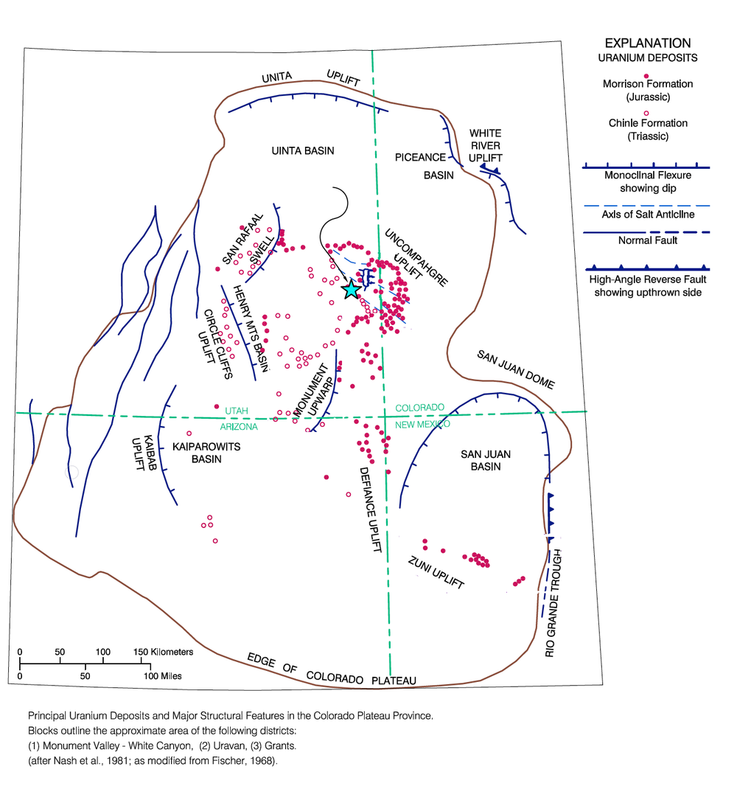 General Electric Uranium Mining Company (“GEUMCO”) operated the Pine Ridge mine in the late 1970s, producing from a sandstone lens in the Brushy Basin Member of the Morrison Formation. The Pine Ridge mine was acquired by Minerals Recovery Corporation (“MRC”) in 1981 which developed a decline to the Salt Wash Member of the Morrison Formation, but halted operations before any significant production. Low uranium and vanadium prices forced all production throughout the district to cease about 1991. Ores from these mines have been successfully processed at the now dismantled Uravan Mill (Umetco), the now dismantled Moab Mill (Atlas Minerals Corporation), and the operating White Mesa Mill, now owned by EFR White Mesa LLC, a wholly-owned subsidiary of EFR. (1,658,000 lbs U3O8 at an average grade of 0.20% U3O8 and 8,431,000 lbs V2O5 at an average grade of 1.02% V2O5). From 2008 through mid-2012, Denison drilled 220 exploration and fill-in (confirmation) holes in the project area. EFR drilled another 27 holes on the Energy Queen property and the State land to the northwest of the Energy Queen from 2007 through 2012. Due to declining uranium prices, production ceased in October 2012 at the Beaver/La Sal Mines and in December 2012 at the Pandora Mine. Both mines were put on a standby status and are currently maintained in conditions that would allow them to be placed back into production within a few weeks’ time. (see Peters, Douglas C., CPG., NI43-101 Technical Report - La Sal District Project, 2014). Prospect drilling was carried out on what is now part of Spey,s property by the USGS in 1952 (Hop Creek, Carter and Gualtieri, 1965, and Chernoweth, 1981) and Atlas Minerals Corporation in the 1980’s. The significant uranium deposits in the Uravan Project area occur in the late Jurassic Morrison Formation. The Morrison comprises two members in the La Sal area. The lower member, the Salt Wash, is the main uranium host. The upper part of the Morrison is the Brushy Basin Member; it is from 350 to 450 feet thick. The Salt Wash, approximately 300 feet thick, consists of about equal amounts of fluvial sandstones and mudstones deposited by meandering river systems flowing generally toward the east. The Brushy Basin was deposited mostly on a large mud flat probably with many lakes and streams. Much of the material deposited to form the Brushy Basin originated from volcanic activity to the west. The majority of the uranium production has come from the upper sandstones of the Salt Wash Member known as the Top Rim (historically referred to as the ore-bearing sandstone or “OBSS”), which ranges from about 60 feet to 100 feet thick. Light-brown and gray sandstones and conglomerates of the 200-foot thick Cretaceous Burro Canyon Formation overlie the Brushy Basin. These crop out in the eastern part of the La Sal area (over the Pine Ridge, Pandora, Firefly, Vanadium Queen and La Sal/Snowball areas). This formation contains interbedded green and purplish mudstones with a few thin limestone beds. The Burro Canyon Formation is exposed covering the Brushy Basin at the west end of the area west of the Energy Queen. Locally, silicification altered the limestones to chert and some of the sandstones to orthoquartzite. Orthoquartzite cobbles and boulders litter the Brushy Basin slopes. In the central part of EFR’s La Sal Project (Beaver Mine, Redd Block, and Energy Queen), the Burro Canyon is covered by a layer of alluvium and gravels shed from the La Sal Mountains to the north. These gravels vary in thickness from a thin veneer to over 120 feet thick. The La Sal District uranium-vanadium deposits are similar to those elsewhere in the Uravan Mineral Belt. Host rocks within the area consist of oxidized sediments of the Morrison Formation, exhibiting red, hematite-rich clastic rocks. Individual deposits are localized in areas of reduced, gray sandstone and gray or green mudstone (Thamm et al., 1981). The Morrison sediments accumulated as oxidized detritus in the fluvial environment. However, there were isolated environments where reduced conditions existed, such as oxbow lakes and carbon-rich point bars. During early burial and diagenesis, the through-flowing ground water within the large, saturated pile of Salt Wash and Brushy Basin material remained oxidized, thereby transporting uranium in solution. When the uranium-rich waters encountered the zones of trapped reduced waters, the uranium precipitated. Therefore, deposits vary greatly in thickness, grade, size, and shape. Vanadium may have been leached from iron-titanium mineral grains and subsequently deposited along with, or prior, to the uranium. The uranium- and vanadium-bearing minerals occur as fine-grained coatings on the detrital grains, they fill pore spaces between the sand grains, and they replace some carbonaceous material and detrital quartz and feldspar grains. The primary uranium mineral is uraninite (pitchblende) (UO2) with minor amounts of coffinite (USiO4OH). Montroseite (VOOH) is the primary vanadium mineral, along with vanadium clays and hydromica. There are no Mineral Resource estimates for the Uravan Project. The past producing mines immediately adjacent to Spey’s property exploited the uppermost sandstone unit of the Salt Wash Member of the Morrison Formation. At the Firefly Mine, the unit is 30-90 feet thick. The mineral deposits trend east obliquely to the axis of the La Sal syncline. The higher grade past producing orebodies in the Firefly deposit are tabular or undulating layers up to 3 feet thick, 50 feet long and 40 feet wide. Both oxidized and unoxidized mineral deposits are evident in the mined areas of the Firefly Mine. The ore produced at the Firefly through 1956 contained 2.04% V2O5 and 0.35% U3O8. The mines in the La Sal Area belonging to EFI, other than the Energy Queen mine, are expected to be able to return to production quickly once economic conditions allow for the mining and milling costs and mining of known resources at a profit. A detailed Electret radon survey will be carried out over the property to define drill targets. In addition, drilling is planned to be performed to identify resource potential suggested by the radon survey and previously known drill intercepts in these areas. In addition to drill testing the Salt Wash Member of the Morrison Formation, drilling should penetrate further to test the Moss Back Member of the Chinle Formation in light of a quality intercept reported to have been encountered in one instance on EFR’s adjacent project (Peters, D.C., 2014).